We drive out at 8pm, from San Jose where we'll staying and head toward San Francisco to check it out at night. My aunt thinks we're mad. "Stay away from Mission St," she says, as we leave. Yes, I know, I reply, remembering the time my dad booked a motel for the family in that rough neighbourhood, by mistake. 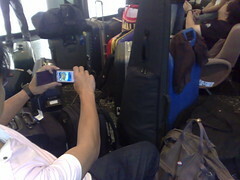 After an hour's drive on the Freeway, we use the N95's GPS to find our way in the city. 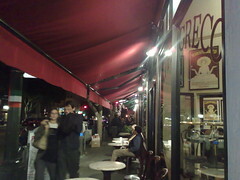 We grab a latte at Caffe Greco's and then walked into Jazz at Pearl's, a jazz club there, in time to hear the big band and the strains of their last number for the evening. The lady at the door let us stand there and listen to the last song for free. I am SO going back with tickets to catch one of their shows. It seems like a very reputable jazz club. I uploaded a short video of the place over at mrbrownshow.com. 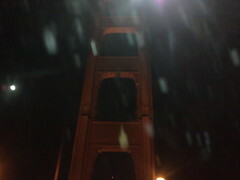 We drove to the Golden Gate Bridge after our coffee, thinking to see the bridge at night. Er, it was not lit, and we ended up paying for toll to get back into San Francisco. Silly us. Road Trip: San Francisco, here we come! We're off to San Francisco for the week! San Diego was great, and we enjoyed the company of Ah Beng, He With the Kiasu Car, and Ah Long Ge, and your families (thanks guys!) but now it's time for San Jose and San Francisco! If any friends of mrbrownshow.com or mrbrown.com would like to meet up, drop me an email and we'll see if we can meet up! Thanks! 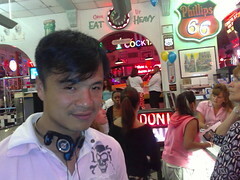 We're at The Corvette Diner in Hillcrest. For some retro dining, haha! 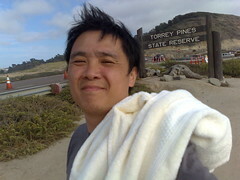 Daniel and his family kindly brought us to Torrey Pines State Beach and Reserve, San Diego, for some sun, sand, and sea. We swam, boogie boarded, and caught tiny crabs that looked like sand-coloured cockroaches. It was one of the most pleasant days we've had in San Diego so far. 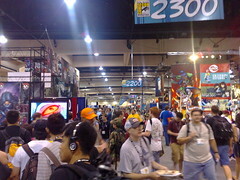 Also check out some of the photos and videos (of Jabba and Iron Man) taken at Comic-con. Malaysian police kena get special car parts for special price! At mrbrownshow.com. Harry Potter casts its magic in India! Line up for it at mrbrownshow.com. Where got high price? Find out at mrbrownshow.com. Be extra careful when you need to issue punishment. Learn how to ensure no mistakes are made, at mrbrownshow.com. Bruce Willis as a suave lady killer? New movies reviewed at seewhatshow.com. Get your latest news headlines at mrbrownshow.com. Gold Lightan and Scope Lightan from Golden Lightan, Ryan's only purchase from San Diego Comic-con 2007 so far. He was most pleased to find these because he was a fan of the series way back when he was a kid. Yes, Ryan is also Uncle like me. So far, I have not bought any toys yet. I am a poster child for self-restraint. I am also bleeding internally. Tired from running around all day shooting video. Going to crash now. The boys played a rowdy network game of Mario Cart on Nintedo DS Lite. We tried to do DOTA too, but the computers would not connect and the switch we brought had the wrong power supply. I have been restrained so far, not picking up any toys. Only got some Toki Doki tees for the missus. 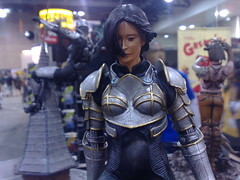 But the toys here look gorgeous. There was a queue of people for the Lost panel. There were going to be discussions about Season 4 by the cast and crew. It was supposed to start at 5pm, but by 3pm, people were already filling up the hall. Kunkka bought an MP3 player in the form of Soundwave, the Transformer. 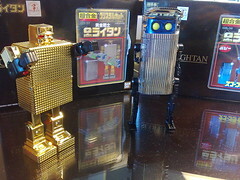 It is made by Takara Tomy. It even transforms. Uses SD cards for memory. Neato. I thought it was the coolest thing any of us has bought so far. We are finally in! After queuing, like, forever, to register and get into the hall, we finally get in at 6pm for the Pre-show. One long multi-stop flight to San Diego. But at least we're in the company of friends. 10 of us, to be exact. We'll keep you guys updated as soon as we land. The wife and I spent the wee hours of the morning at the Punggol Nasi Lemak stall. Just talking and eating. I had to leave for the airport at 4am so no point sleeping. Damn, I miss my wife and kids already. Taiwanese talkshow talking about Singapore's democracy and transparency, and comparisons with Taiwan's political scene. Conducted in Mandarin and Hokkien. But of course, foreigners with no stake in the future of Singapore, will not be allowed to interfere in Singapore's domestic politics, and Singaporeans make their choice every election year at the ballot box and so on and so forth. 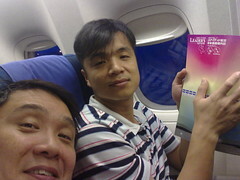 Part 2 of our trip to Communicasia 2007. We check out the new LG phones - including a new HUGE one that can open and shut on its own. Go see them at wtfshow.com! More sequels this week! We review Die Hard 4.0, Harry Potter 5, and one non-sequel, Disturbia at seewhatshow.com! Watch what you eat because even food also got pirated one. Let mrbrownshow.com educate you. Time to go digital at mrbrownshow.com!